From notes taken Wed. July 27, 2005 on a visit Medora Brick Plant site by Steve Graves. Bernard Gray worked at the plant first at the age of 16 in 1946. After igh school he served two years into military service during the Korean War and then returned to work at the plant. Mr. Gray knows brick. Especially Medora brick! Plant is about 1.1 miles from Medora town & south along the B & O rail line. (Mr. Gray’s father) Ralph Gray, pictured left, was Superintendent in ~1935 (will insert his years of service). 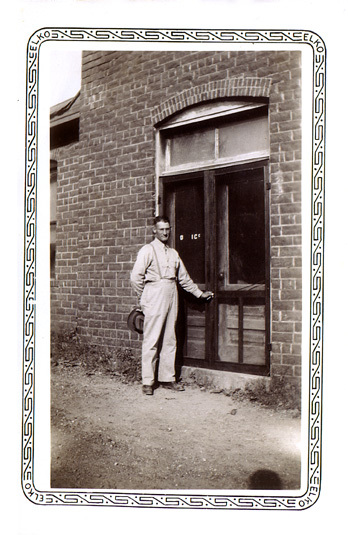 He started as a laborer at the plant in 1925 after the company was purchased by Mr.'s Robertson and Heller the principals of the Jackson Brick & Hollow Ware Co.
Gray's son, Erridine, became the plant's salesman. He died in 1969. Ralph Gray's son Bernard would follow him as plant manager. There was a hill that sat behind and between the horse barn and the power plant/workshop that was excavated up through about 1938, said Gray, providing much material. Also to the west across the Brick Plant Road leading up the hill there was a large hill that was excavated. The Ralph Gray family lived in a house just west of the plant. § From the hayloft of a barn near the Gray home 1920 an aerial photo of the brick plant was taken from the hay loft (photo that Paul Carr of Vallonia has and a copy of which was displayed at the 2005 Jackson County Fair - Antiques Building. § There was a hill west of the office (and across the road) that was excavated. Steam shovels but also electric ones were used to excavate shale, Gray said. Photo left: A view from the yard of the home the Gray's occupied in the 1930's looking northeast toward the 'horse barn'. 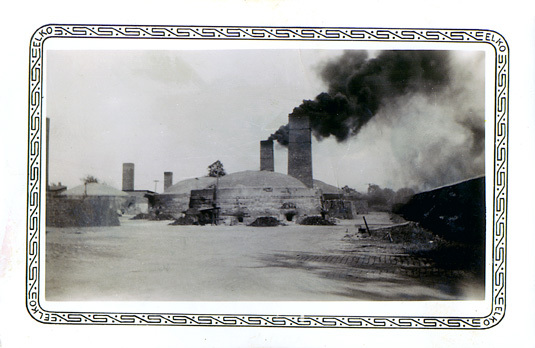 Gray said that all the kilns were not built at the same time (1906 as suggested in an Indiana historic landmarks book). 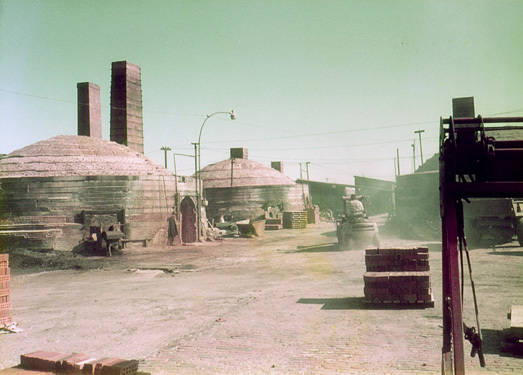 But that by 1936 there were 11 kilns built with #12 in the southeast corner being built in 1954 or 55. The “horse barn” , or what originally was built as such, Gray says was built about 1936-37 and still stands. A 40’ x 70’ small storage shed still stands today in the middle of the complex. Domes were self supporting. Dome brick was different in that their sides were shaved (tapered) and by pounding in a key (locking) brick say every 4th or 5th brick at the domes base the those bricks would be secured, then the pattern repeated. By the time the process was at the top of the dome, just key brick were used. Domes lasted about 24 years, Gray said. Through normal expansion and contraction from firing the kiln 2 or 3 times per week, the dome brick would loosen and make what appeared to be a crack. The dome would be disassembled, and the brick reused in rebuilding the dome locking all brick in tight again like when it was first constructed. Dome brick could be used 2 or 3 times. Domes were constructed from about 15,000 brick. 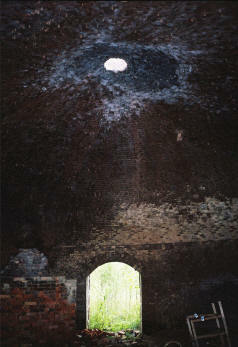 A look up at a self-supporting kiln dome today and the hole in the ceiling's center from which measurements were taken to know when the firing of the bricks was complete. There were/are 10 fireboxes distributed evenly around the base of each kiln where coal was hand fed. A few facts - quickly recited by Mr. Gray. It took 2 yards of material (shale which is a combo mix) to make 2000 brick. 1000 face (wall) brick weighed 4000 pounds. Barium was for a time used by brick producers as a congealing agent to make brick set up faster. It also brought out the natural color of the brick by cutting the white (chalking) aspect to finished brick. Gray said that the plant had about 6.4 million brick in inventory on the property (assume in Gray’s superintendent days 1970's & 80's). He spoke about taking inventory regularly from a high vantage point to the west of the property…(perhaps the top of the horse barn - will have to ask). Before motorized forklifts came along plant workers moved brick around by using moveable small sections of narrow gauge steel track. They'd set tracks along various pathways and used 3 foot by 5 foot carts to move 600 brick per cart to the kilns to be fired and out again to rail cars or storage. Track still visible today. 1st - the temperature would be raised slowly over 24 hours to reach 600 degrees. 2nd - raised steadily again the next 24 hours. 3rd - and finally raised to about 1600 degrees by 72 hours from first firing. After which time the “settle” was measured every two hours. The settle was measure from the top of the kiln dome. There was a metal plate over the ~2’ diameter dome hole and the plate had a hole in it down from which a measure could be made to the top of the brick stack.. (Understood the kiln was almost entirely filled with bricks to be fired…out close to the walls and up near the top of the dome. Notes from earlier Gray conversation said that when there was a 12- ½ inch settle the brick were done. The kiln dome center is about 30 feet off the floor. But the temperature was not to go above 1850 degrees other wise the brick would burn up – making 'clinkers' a cindered finished brick. Gray said there was a plant in Indiana near Cayuga that specialized in clinkers. Both in the form of roughed exterior brick and by burning up the brick and then busting it up into cinders as in cinder running tracks at high schools and colleges. Kilns were worked in sequence and one stack serviced 3 kilns via an underground system of tunnels. But a stack could be used in connection with one kiln firing at a time. In about 1936 the plant equipment was powered by a large 4 piston diesel engine – which required fuel oil and its holding tank. There was also a smaller engine as back up. There was well water and pond water. 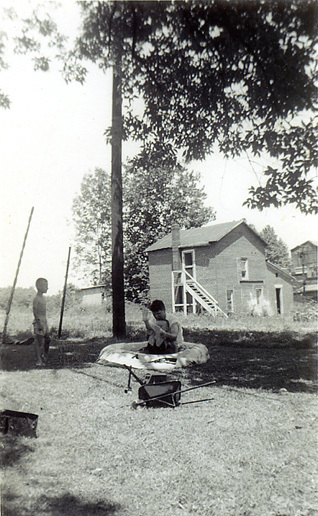 Gray said that as a boy in the 1930’s he at times took his bath in those ponds. The plant closed in the spring of 1942 and reopened in the spring of 1946. James Heller had been in the service during the last part of World War II and Joe Robertson had died. During this interview Bernard Gray referred to Mr. James Heller, president of the brick company ~1946-1992 (companies actually since he also owned controlling interest in the Brownstown Brick & Hollow Ware Co. as well), as “a prince of a man”, as “a very private man” and as having a manner that was “strictly business.” Gray said he sat across the desk from Heller (in the small office) for 24 years ... and…never was invited to his (Heller’s) home for example. And on Gray’s last day of work at the plant having served for 46 years the last 24 as Superintendent, Heller handed Gray his last check (for the normal amount of pay due) and said “well that makes us even” - no final bonus, profit share, etc.. Heller died about eight years later (2000) with an estate estimated / rumored to be about 14 million dollars. Mr. Gray said that Mr. Heller's management style including walking around including on and off the property without prediction. He would arrive to work for example by parking on the eastern side of the plant property and walking in through the complex. He would usually leave for the day at various times and always without announcement to anyone. This would have the effect of keeping everyone on their toes, though Mr. Heller never spoke to managers and foreman about his rationale for this. October 1984 looking down the brick-paved channel between the what were essentially the plants two rows of kilns and toward the smaller storage shed. Showing at the bottom center of the kiln on the left is the 1970's installed machinery that fed coal evenly to the stokers that eliminated the visible smoke. A lot of brick in the later years of plant operation went to renovate and brick up windows in commercial buildings in the Midwest and New Jersey, Gray said. These buildings were no longer dependent on sunlight as internal light or on air in from windows – switching over to electricity and air conditioning. Mr. Heller trying to collect a debt from a client in Detroit using a Detroit attorney who offered to use muscle to get the debt collected and as a result Mr. Heller felt that if they’d do that to collect a debt from a client they might send someone his way so he swore off shipping things Detroit way. Medora Brick Plant supplied the brick to Purdue University for about 20 years (~1960-1980). They became the preferred supplier over the Brazil / Veedersburg plant which had run out of clay and had to get material elsewhere, which change the color of brick that they were able to produce and provide Purdue. And there were some management problems at that plant as well, according to Gray (who himself was Medora Superintendent ~1968-1992). Some brick to Ball State as well said Gray. The industry average in the 1960’s to 1990’s was that brick plants produced about 60% of their brick for architects (commercial) and 40% for residences. Medora’s percentage through those years, said Gray, was 50 -50. 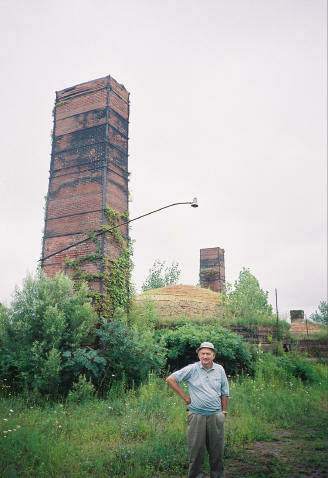 Gray said by the 1980’s men did not want to work as hard or have to work as hard as one had to at the brick plant. There were easier jobs elsewhere paying as much or more with benefits, etc. There always seems to be a market for all kinds of brick Gray said and that once, they combed the plant to fill a client order for 11,000 of the most misshapen marred bricks they could find to be used for a unique look in construction project. Gray commented that the brick business is a good business even for the future. “Brick doesn’t go out of style and the industry isn’t going to be moved out of the country because the cost of shipping the heavy product would be to great (back into the United States and elsewhere). The two biggest producers of brick nationally (1960's - 1980's) Gray stated were General Shale and Acme Brick in Ft. Worth, Texas. General Shale provided all the brick for the Oak Ridge Tennessee nuclear power plant project at a phenomenal profit. By early 1990 the brick plant had 22 shares holders dividing 750 shares. Gray said there was dissension within the Board as to whether or not to close the plant but in the end, production was stopped at Thanksgiving November 1990 and officially in January 31, 1992. It was mentioned that some if not all of Medora's brick making machinery and equipment after its closing went to a brick plant in Brazil, Ind. (near Terre Haute). If you have photos, stories, corrections to what's shared here, etc. here's how you can help tell the Medora Brick Plant story. "Now follow me on this - " said Bernard Gray. "Across the road and train tracks from what was to become the Jackson Brick and Holloware Co. was the (Jonathan "Jont") Robertson farm (NE Brownstown area). His son was Joe (Joseph M.) Robertson. The site for that plant was on land owned by Thor Heller, brother to John Heller." John Heller had a farm SW of Brownstown about 1 mile south of Rt 50 on the along the road to Vallonia where in addition to primarily farming John Heller made and sold brick and tile. (According to Paull Carr the little pond that can be seen there now is said to be the pit where the shale was ground up by a horse). The Deal: "In exchange for stock in the Robertson’s JBHW John Heller would cease his operation in favor of JBHW. Basically they bought up the competition" said Gray. JBHW was born (and at about the same time the founders of Medora Shale Brick Co. were organizing their company - July 1904). In the 1920's with an economic slowdown that preceded the Depression, Medora Shale Brick Co. went bankrupt. The Robertsons and John Heller purchased it about 1923. Joe would run it while John farmed. In the 1930’s Joe would mentor John Heller's son Jim Heller (b. 1910) to take over the operation of both the Brownstown and Medora plants - which Jim did after serving in WWII. Not particularly wanting to farm like his father Jim Heller went to work at the brick and holloware plants in the early 1930’s. Bernard Gray said that Jim would later say that he had inherited enough that he wouldn’t have to work the rest of his life but he wanted make something of his life. Joe Robertson and his father Jonathan "Jont" Robertson purchased the Ewing Mill Company around 1900 known as Robertson Industries since 1960. After serving in the Indiana house in 1900 and 1902, Jont Robertson organized the Jackson Brick and Holloware Co. in about 1906 and was a full partner along with his son Joe in the Medora Shale Brick Company in 1923. Like his father, grandfather and great-grandfather Joseph M. "Joe" Robertson became involved in state politics. He served in the Indiana house in 1917; he joined the state senate in 1933 and resigned in 1938 to fill the vacant post of state treasurer, a position he held until 1941. Gray shared the story that "While Joe Robertson (Democrat) was Treasurer (listed officially as 1939-1941) and could among other things oversee state payments to contractors on building projects - there was 'a rule' that state buildings would use only Indiana brick in their construction. There came an occasion (date?) using an out-of-own absence of Robertson's, that the legislature took an impromptu vote and overturned the requirement" - to the dismay of Robertson and the Indiana brick manufacturer's dismay. When WWII started Jim Heller didn’t want to go – he wanted to stay with the plants that he was taking increased management responsibility for said Mrs. Heller (Oct. 14, 2005). Bernard Gray said "Joe Robertson (perhaps using insight and influence) advised Jim to choose the Army versus other corps of service. After basic training and service in the Washington DC area Jim was assigned to duty at Attabury, the WWII prisoner of war holding facility located just north of Jackson Co. in Columbus, Indiana. Jim completed his duty then returned to Jackson Co. to start up the plants which had been closed during the time Jim was away." According to Gray "A clerk in Robertson's Treasurers office (himself a Jackson Co. resident) said that Robertson's salary was $4000 a year and that he banked his check and didn’t touch the funds during those years." According to Mrs. Jim Heller, a typical morning for her husband was to wake at 4pm and head down to the Brownstown plant (to check on things). Bernard Gray said Jim Heller would often (then) be down to the Medora plant by 5:30am when a new crew and the plant manager would be coming to work. Heller would head home for breakfast and go on with his day. Bernard Gray said that he never new Jim Heller's schedule. Heller would come as well go unannounced to anyone. He’d park at different places on the plant's perimeter and enter the grounds from different directions keeping a watchful eye on his operation. Mrs. Heller had told Paul Carr, of Vallonia, that it was the saddest day of her husband’s life when he had to close the Medora plant. Brick plant employees known as tossers and setters wheeled bricks in and out of the kilns on specially made and balanced wheel barrows. "100 bricks made a full wheel barrow load – 50 on one side 50 on the other. Workers loaded those 3 or 5 brick at a time. The weight was 400 pounds but the structure of the especially made and balanced wheel barrows was that such was maybe only 50 lbs weight down on the wheelers hands. Wheelers would push off slide down the ramps taking brick out of the kilns to storage. And some employees could steer a full wheel barrow with one hand." Mr. Gray said that a normal expected work load per day was 90 wheelbarrows - loaded and unloaded. Additional text from this Oct. 14, 2005 interview to be added ... including information about automation passing up Medora and Indiana's other hand-made brick plants and a story about a disgruntled plant employee from Salem firing his shotgun at the company outhouse thinking Bernard Gray was inside...and how the dispute was eventually resolved.